Kakunodate Samurai Residence (角館町武家屋敷通り) is a street with many Samurai Houses. It is located in Kakunodate, Akita Prefecture. There are 6 original Samurai Houses and the scenery is well preserved as Edo period. Kakunodate is one of the most popular tourist spot in Akita pref. There are many beautiful trees including Sakura. They are planted when this castle town was built. Therefore, the view itself already has a history of over 400 years. Because of its beautiful scenery, Kakunodate is called Little Kyoto of Deep Mutsu. Most of Samurai Houses closed around 16:00. Kakunodate Samurai Residence is one of the most popular tourist spot in Tohoku. It was used to be a castle town. There are many Samurai residence with beautiful gardens and trees. The structure of Samurai Town is also preserved in a great conditions. Black walls, Samurai Gates and streets are the same as when the castle town was designed. The trees survived from any kinds of disasters, therefore, they are over hundreds years old and has an excellent scenery with history. Some of these trees are Sakura and Momi, therefore, Kakunodate is very famous for Sakura spots in spring and Koyo spots in Autumn. Also it will be covered with heavy snow in winter. This beautiful scenery of the harmony of Samurai, history and nature is designated as Preservation Districts for Groups of Traditional Buildings. Odano House (小野田家) is one of Samurai House located in Kakunodate, Akita. Odano Family was the middle class Samurai of Satake clan. Odano family was very strong Budo-ka, Japanese martial artist. There was used to be a dojo in this house. The house was reconstructed in early 20th century as the same Samurai House. It has a beautiful Samurai Garden with old trees that planted when the house was built. 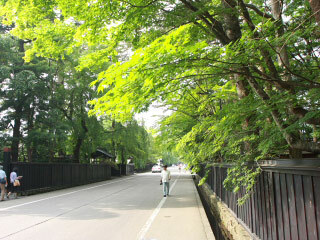 Those remaining trees tells the story of Sengoku era and history of Samurai. Kawaharada House (河原田家) is one of Samurai House located in Kakunodate, Akita precture. Kawaharada Family was 150 koku Samurai of Satake-Kita clan. Current building was constructed in the end of 19th century. However, it's structure is the same as it used to be during Edo period. Iwahashi house (岩橋家) is one of Samurai House located in Kakunodate, Akita. Iwahashi family was 86koku Samurai of Satake-Kita clan of Kakunodate. This house was constructed in late Edo period. It has a view of Samurai sprits. Kakunodate Aoyagi House (角館青柳家) is one of Samurai House located in Kakunodate, Akita prefecture. Aoyagi family was 104 koku Samurai of Satake-Kita clan. Aoyagi House is the most gorgeous Samurai House in Kakunodate. The main house was reconstructed in 1860. It has a huge garden with many seasonable flowers. Many buildings of Aoyagi family are restored for museum and restaurant. Kakunodate Ishiguro House (角館石黒家) is one of Samurai House located in Kakunodate, Akita prefecture. It is the oldest house in Kakunodate. The garden, house, gate, walls and Kura are preserved in great conditions. Ishiguro House is the only Samurai House that visitors can step inside of the house. The main house was constructed between 18th to 19th century.